What was that bit about not having winter accessories to wear together? I am happy to report that problem has officially been resolved. Thank you for all of your lovely comments and encouragement along the way. Let me introduce the Min Ulla Set! 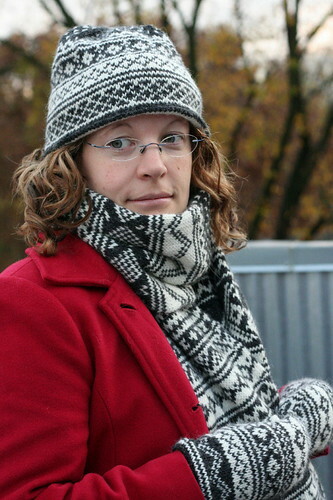 The scarf, hat, and mitten patterns are available as Ravelry downloads for $6.00 each. The set of three patterns can be purchased for $15.00. In early October, I approached Berroco, Inc. with a swatch and sketch for this design and the company generously donated the yarn for the project. As I mentioned before, I tried this pattern out on a hat with Harrisville Designs New England Shetland leftovers, but it was clearly the wrong choice. Can you imagine how long it would have taken me to knit this at a fine gauge? I still have not yet finished that sample hat! I really wanted a worsted weight yarn, and one with a bit of a halo to it as well. Berroco Ultra Alpaca was a great choice because the yarn is smooth enough to show off the stitch definition but soft and fuzzy enough to make a really warm set. 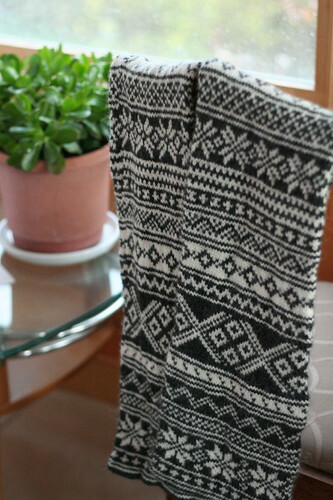 This Scandinavian-styled scarf is made in the round as a tube, its ends grafted together in the finishing process. Symmetrical about the center point, it is comprised of many very simple peeries of small repeats, along with a few more complicated snowflake and XOXO peeries. The scarf pattern is given as a series of10 charts. I broke the pattern up this way to make it a more portable project since smaller charts are easier to read. Although the charts may seem complex at first glance, upon closer examination, one will find that at the level of the individual round, the patterning is quite simple. After a while, the charts should only be truly necessary for the XOXO and snowflake patterns, or when starting a new peerie. Trust me, it’s true. 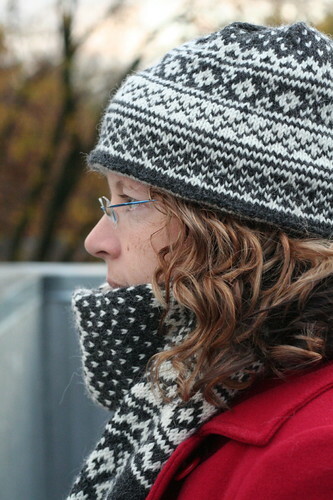 The hat is knit in the round with a contrasting liner tacked to the inside of the brim for extra warmth. I could not decide on a brim pattern for the hat, so I included four different versions in the pattern. 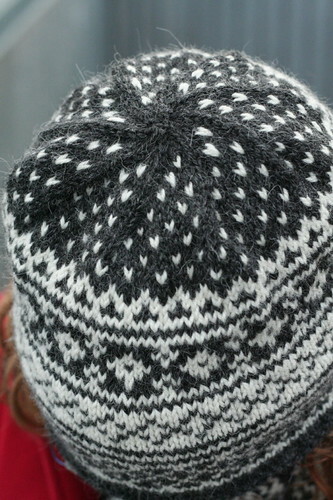 Two versions include small peeries like the sample hat shown, while the other two versions feature traditional snowflake patterns. Between this scarf and the other projects I’ve made with snowflake patterns, I was feeling a bit burned out on snowflakes by the time I started the hat; therefore, I settled on a version with peeries only instead. In the end, I think I prefer the look of the small peeries to large snowflakes at the brim. Each version of the hat is topped with a lice stitch, spiral crown. 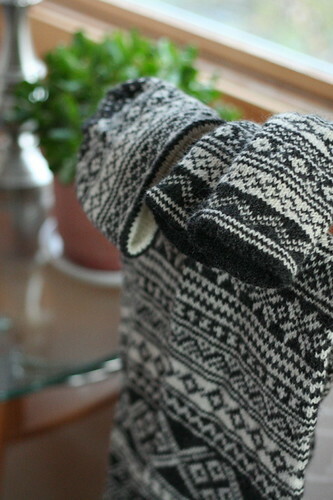 This is the first pair of worsted weight, non-thrummed mittens I have made in a long time. I seem to have forgotten how quickly mittens knit up when not done at 10 stitches per inch! Amazing! 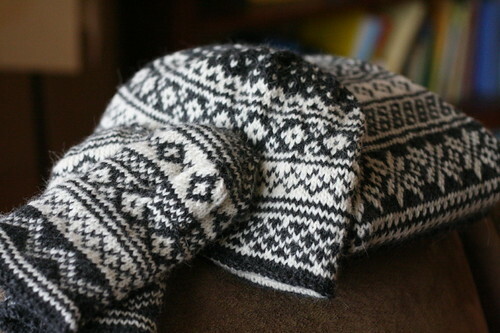 Each mitten took me a day – a day with plenty of distractions too. I think I still prefer tightly knit mittens over worsted weight ones; however, these will certainly prove at least as warm as finer gauge mittens I’ve made because of the lining! Although I love lined mittens, my one complaint is that a lined thumb renders it practically useless. 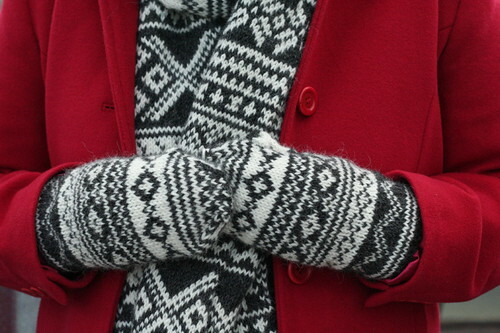 The last two pairs of lined mittens I’ve made have featured keyhole thumbs in the lining. Bonus? Not having to knit a second thumb. Finally, I have one last pattern coming out in the next week – Hedge Fence Pullover – and then I swear, I’ll be done for a while. I have a baby to deliver, you know. I’m delighted to be the first to congratulate you on such a beautiful set! Stylish and warm – nicely done. So very beautiful. I need a little more practice before I venture in such a big project but it will certainly go on my favorites on Ravelry! Oh My Goodness. Those are absolutely stunning! Love the keyhole thumb idea and liner! Oh my gosh, what a beautiful set! I love this set, congratulations! I agree that knitting the lining of a thumb does cause some difficulties, but I can’t imagine leaving my thumb out there to freeze while the rest of my hand has a nice cozy double-layer. Doggone it, I keep swearing I’m going to STOP buying patterns because I already have so many I know it’s impossible to knit them all but then you talented designers keep coming up with such beautiful and irresistible things to knit, I just can’t resist! Those are absolutely beautiful together! Fantastic patterns! Great set, looks like it’d be a nice relaxing way to do more colorwork. Quick question: Is the combined pattern (all 3 for $15) available in your ravelry store? I looked and saw all 3 separately available, but not the combination. I like buying things in the rav store so I can keep pdfs stored in my library (in case I need another print out). Oh my goodness, you have been so busy with interesting and complicated designs lately. This set is so beautiful! Love, love, love the look! Fantastic job, as usual! The set is gorgeous & I love the scarf. A great idea to knit in the round! The scarf was already stunning. The coordinate set is fantastic.